And it is great to see you as moderator. Howzatt? 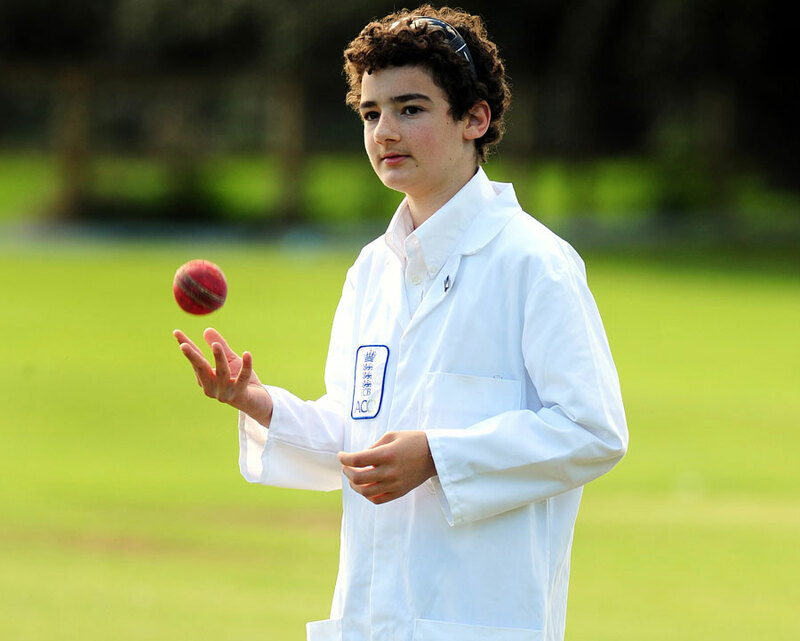 Youngest umpire in the world! England on top of Australia? Debutant Cheteshwar Pujara struck a confident 72 as India eased to a seven-wicket win over Australia in Bangalore to complete a 2-0 series victory. Set 207 to win, India lost Virender Sehwag early on but rebounded with a 72 stand between Pujara and Murali Vijay. 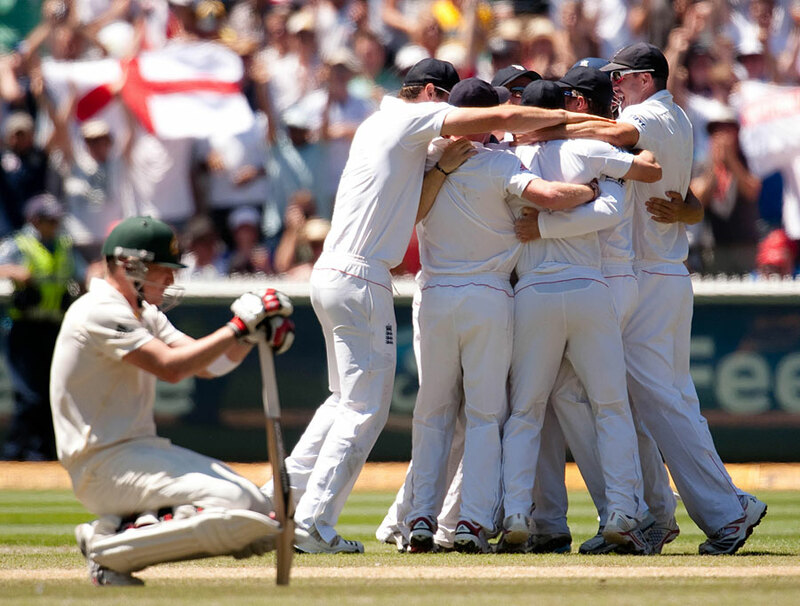 The loss pushes Australia down to fifth in the Test rankings, one place below England going into next month's Ashes. LONDON: Unruffled composure over two decades, in the face of the world's most hostile attacks and the frenzied demands of a celebrity-fixated society, confirms the true greatness of Sachin Tendulkar. For a man in his 38th year, Tendulkar's appetite for runs remains unsated and his unrelenting determination to keep wringing the utmost out of the gifts so lavishly bestowed on him at birth is phenomenal. So, too, is his ability to remain unaffected either on or off the field by the relentless glare of public adulation which makes a private life impossible in his native India. No hint of scandal has touched the man who last weekend became the first person to pass 14,000 Test runs in the second Test against Australia and he remains the complete team player. "It is about what I want to do for my team," he said after scoring his sixth Test double-hundred in 171 Tests and his 11th century against the team who have dominated cricket during his career. "And I will not compromise on that." Tendulkar has shown unqualified commitment to his team and his sport since Pakistan's Waqar Younis bloodied his mouth with a short-pitched delivery in his debut Test in 1990 at the age of 16. Eight days later he became the youngest man to score a Test half-century and 20 years on he holds the records for most Test and one-day runs and the most Test and one-day centuries, a scarcely believable 95 in total. The ultimate accolade came from Don Bradman, whose Test average of 99.94 dwarfs all his rivals before or since, including Tendulkar whose current mark is just under 57. Towards the end of his life Bradman, the first celebrity cricketer, whose run-scoring feats for Australia in the depths of the 1930s depression bolstered an emerging nation's morale, called his wife into the room to watch Tendulkar on television. "I never saw myself play but I feel that this fellow is playing much the same as I used to play, and she looked at him on the television and said, yes, there is a similarity between the two," recalled Bradman, who was no more inclined to make unconsidered statements that he had been to play rash shots. "To me his compactness, his technique, his stroke production, it all seemed to gel as far as I was concerned." Tendulkar scored his first Test hundred at Old Trafford at the age of 17 and he had still to celebrate his 20th birthday when a century off the Australians at Perth won the unstinted praise of cricket's fiercest competitors. The West Indian, Pakistani and South African fast bowlers at the start of his career held no terrors. His later duels with Shane Warne became the stuff of legend. Tendulkar, who overtook compatriot Sunil Gavaskar's world record of 34 Test centuries in 2006, has reserved his best for Australia. Under Steve Waugh, Australia fielded a side comparable to Bradman's 1948 Invincibles or Ian Chappell's swaggering buccaneers of the 1970s. They met their match in India in 1998 when Tendulkar launched a sustained and successful assault on Warne, generally regarded as the best spinner of all time, to average 111.50 in a 2-1 series win for India. On Tuesday, while Warne fumed via Twitter on Ricky Ponting's field placings, Tendulkar was still Australia's nemesis, scoring the winning runs to give India a 2-0 series victory which consolidated their place at the top of the world rankings. Unsurprisingly the relentless demands of modern cricket have taken their toll and Tendulkar was troubled by injuries to his elbow and his shoulder and a slump in form in the middle of the last decade. He rebounded to such effect that this year he was named the International Cricket Council's ( ICC) cricketer of the year for the first time, after averaging 81.84 in 10 Tests during the review period and 65.28 in 17 one-day internationals. Tendulkar intends to play next year in the first World Cup to be staged on the Indian sub-continent for 15 years, a tournament which all India fervently hopes will give their team the trophy for the first time since their upset victory over West Indies in 1983. That unexpected triumph sparked an explosion of one-day cricket in India accompanied by a commercial boom which has helped to make Tendulkar a wealthy man by any standards. Wealth and fame, though, seem to have scarcely affected a man whose work ethic has been a constant since he accumulated prodigious scores as a schoolboy. He was predictably named man-of-the-match and man-of-the-series after the second Test against Australia but preferred to praise his team mates rather than talk about himself. When he did it was with humility and respect for his sport. "I've played 20 years but that doesn't mean that I know everything about cricket," Tendulkar said. "It's important to be a student of this game. That's when you can actually learn and get better. Learning never stops." Nov 03, Melbourne: Sri Lanka claimed the victory against Australia by one wicket in the opening match of the One-Day International tri-series Wednesday at the Melbourne Cricket Grounds. Incredible batting by Angelo Mathews with a not out 77 and Lasith Malinga for 57 in the last 25 overs combined with Thisara Perera's bowling in the first inning led to the unexpected finish. England's mantra on this trip has been: "Do unto Australia as they've always done unto us." And with the Ashes secured for the third series out of four, that is exactly what they have achieved. Poms having a great time in Oz. "When Sachin Tendulkar travelled to Pakistan to face one of the finest bowling attacks ever assembled in cricket, Michael Schumacher was yet to race a F1 car, Lance Armstrong had never been to the Tour de France, Diego Maradona was still the captain of a world champion Argentina team, Pete Sampras had never won a Grand Slam. India beats Bangas, Lankans beats Canucks, and Kiwis beat Kenyans; so what else is new? 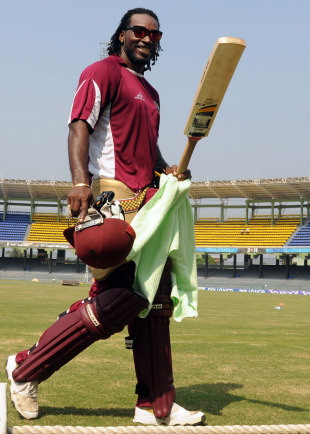 Gayle aims at a WC 200! Looks like Ricky Ponting is simply unable to come to terms with the fact that this Australian team is not a hard nut to crack by any stretch of imagination. And that is why the Australian Skipper has been going around cracking other objects within his reach. If information coming in from Gujarat Cricket Association sources is to be believed, Ponting smashed an LCD television, apparently in a fit of anger, in the team's dressing room here after he was run out against Zimbabwe. The incident took place immediately after Ponting was run out yesterday by a direct hit from deep wicket by Zimbabwe's Chris Meofu in the Group A clash between the two teams. The captain was run out on 28. 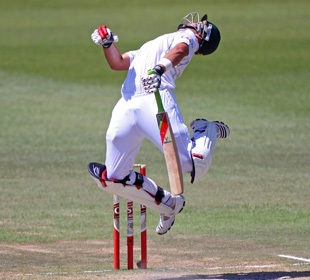 GCA said they have informed about the incident to the Australian cricketing authorities. However, when contacted Australian media manager Lachy Patterson said he was not aware of any such incident. GCA officials said that they would be meeting today to decide on further action in this connection. Punter smashes TV in anger!!! Not with an Irishman hitting the fastest century of the tournament! What is wrong with English cricket? First, the Irish beat them, and now, BANGLADESH! AUSSIES OUT OF WORLD CUP!!! An awe-inspiring Ricky Ponting dazzled and Sachin Tendulkar hit a delightful fifty but it was the imperious Yuvraj Singh who stole the show to lead India to an exciting semi-final encounter against Pakistan. On a dry pitch, aiding turn, India couldn't remove a wonderfully solid Ponting, but found a way around him to hold Australia to a competitive 260. Tendulkar set the base and the middle order threatened to choke, but Yuvraj played a blinder to charge India to a famous win.